During the Fall season I have an abundance of persimmons, pomegranates and apples growing in my garden. I was inspired to create this vibrant salad for my family’s Thanksgiving feast this year. The sweet fruits are complimented with delicious savory flavors that bring sophistication to this unique medley. It’s definitely best to use high quality ingredients for your salad. I suggest having your local butcher slice the prosciutto for you instead of purchasing the pre-packaged brands. You’ll also need a good block of Parmigiano-Reggiano cheese and the freshest walnuts to follow my easy instructions on how to candy them at home. The dressing is light and simple. It’s an olive oil base with white balsamic vinegar and a touch of Dijon mustard to add a hearty aftertaste. There are no set rules for this recipe. You can use a large platter to allow plenty of room to creatively display this eye catching salad combination, adjust the ingredient amounts to your liking, or simply skip the fancy and toss in a bowl and serve. This vibrant salad incorporates fall fruit with savory and sweet flavors perfect for the holiday season! 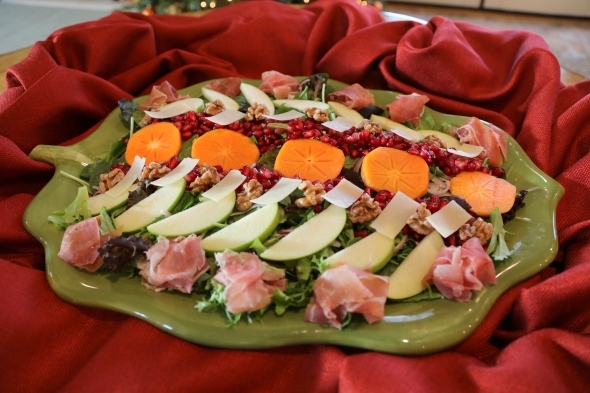 A large serving platter is recommended to create a beautiful presentation. The ingredient amounts may be adjusted to your liking. Prepare Candied Walnuts: Heat 2 tablespoons sugar and 1 tablespoon water in a medium non-stick skillet on medium-high heat and stir until mixture starts to simmer, about 30 seconds or less. Add walnut halves and stir until walnuts are coated with sugar mixture and continue to stir until walnuts are caramelized and golden brown, about 2-3 minutes (lower heat if walnuts begin to smoke). Immediately transfer walnuts to a dish in a single layer and set aside. Note: Use desired amount of candied walnuts for salad. Remaining walnuts may be stored in a Ziploc bag or sealed container at room temperature for up to two days. Assemble Salad: Toss mixed greens and onions in a large platter. Top with green apples, persimmons, pomegranate seeds, candied walnuts, prosciutto and parmigiano-reggiano cheese shavings as desired. Prepare Dressing: Mix dijon mustard and white balsamic vinegar in a small mixing bowl. Whisk in olive oil and add salt and pepper to taste.